This is a checklist to run for each support ticket you process. 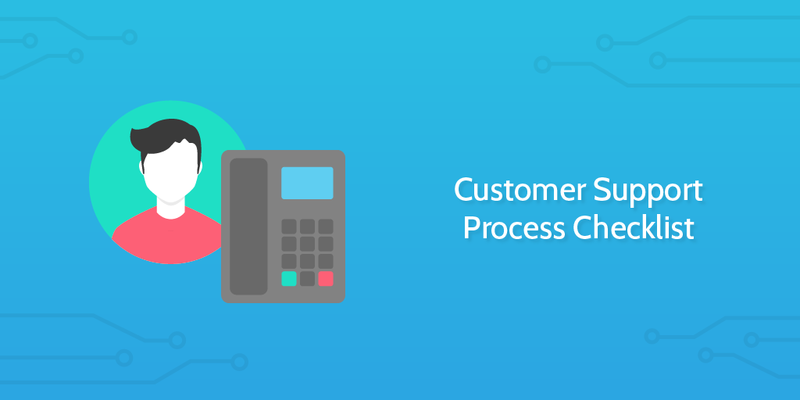 The first step of our customer support process is to move the ticket into one of the below categories. Simple questions are general questions that don’t ask anything specific but is a sign of a user reaching out to see if support exists or to test the system. Examples could be when the user just says “hi” or “what is Process Street?" A technical issue is any issue that relates to core functionality of our product. Examples could include "Why won't my video upload?" or "Why wont my changes appear?" App questions are any questions involving a users curiousity about specific features in the platform and how they work. Examples include anytime the user asks a question about how a feature of our platform works, such as "What's a guest?" "What exactly is a widget" or "What can I use the API for?" While relatively straight-forward in nature, Sales Questions are any type of inquiry where the user is asking about pricing details or shows a desire to sign up for a business plan. When a user expresses interest to collaborate with us in a content sense (writing guest articles), asks about affiliate programs or when a user asks for founder interviews. Users will encounter billing issues from time to time. If we need to manually apply a discount, discover why a users card did not add or why our stripe webhook isn't loading, then this is a billing issue. Anytime a user proposes a change to our platform that is either in the works, or not thought of yet, this is a feature request. Sometimes users will have complex issues that go across multiple different categories of problems. For example, a user might ask about billing in the same question they ask about the potential for an audit trail on their check lists. Sometimes as a support staff member you might be a bit lost in terms of what the user wants. In this case, you will need to ask the user more questions and details about their particular task at hand. if you see a common question about billing you would type #billing to then see the list of saved replies we have made for that category of saved replies. When a ticket comes in, part of the battle is utilizing the information that Intercom gives you. This information will give you a more 'full circle' view of your users. This information will allow you to know EXACTLY who your user is and what they're using. 'Hi there, I sure am! How can I help you today? Have you checked out our Process Street User Guide? 'Hi there, thanks for reaching out! Process Street is your resource for managing teamworkflows, recurring processes and documenting your standard operating procedures. You should check out our handy user guide here. Simple questions aren't questions about anything. They are usually results from when users use our Intercom chat applet for the first time, or someone who's just curious about who we are. You can create a large number of saved replies, that also include HTML markup, for ultimate mastery of how our messages will appear to customers. However, if you create a saved reply, add a card for it in Trello and make sure it is approved before you ever use it. Be sure to defend why you think it's necessary. 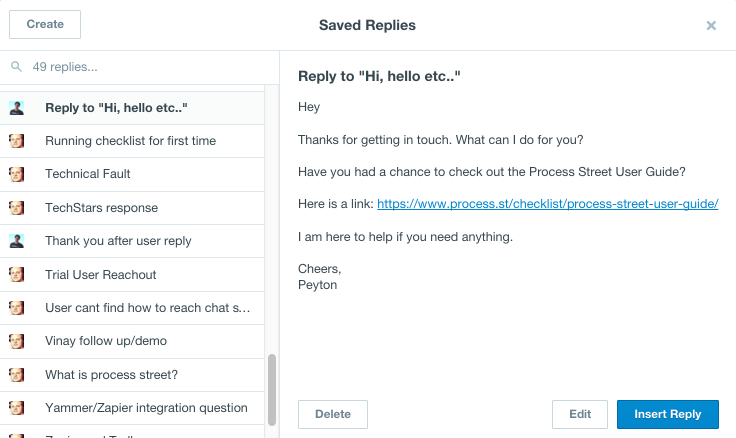 As shown above, Intercom's saved replies allow us create and manage answers to some of our more common simple questions. The first thing you need to do for a technical issue is to see if you can replicate it. Jump to the “testing” task (number 15) for an explanation on issue testing. "None of my changes are saving to my templates"
"I just logged in and noticed all my templates are gone"
"My Slack integration is not working, how do I fix it?" "I keep getting the 'Cant find template' error?" "The support chat isn't working"
Hi there User, thanks for reaching out. I'm sorry you're having this issue. I was able to replicate this on my end, and I will be creating a bug report ASAP. I'm going to work with my technical team to fix this as soon as possible, and I will get back to you when we have more answers. App questions are any question related to how to use the different features, functionalities, buttons, screens or anything else related to the app. These are generally releated to topics in the user guide too. Hi there, how do I put one of my youtube videos in a template? Hi there user, Thanks for reaching out! Did that work? Let me know if not and I’ll be happy to help. Hi, I want to bring my assistant on the platform but I dont want her to be able to edit documents. How can I do this? By default, all sales related conversations need to be immediately sent to the Sales box. The sake of this section is to reiterate that if you notice any ticket somehow related to a Sales matter, then you need to immediately assign that issue to the 'Sales' box. "Can you please confirm that if we buy approximately 40-50 licenses that we can get that for 4.17 USD each? We are currently evaluating different systems and the plan is to make the decision in December about which system to buy." Types of questions you will commonly see in regards to Marketing and PR with our organization. Create a note for all interview requests mentioning the person they want to interview. Immediately assign to Marketing box. My name is X and I am a freelance writer interested in guest posting on google.org. I have been freelance writing for a few years now and have written blog posts on everything from business, finance and technology, to parenting and pregnancy. If you are interested, I am willing to offer you high quality posts for your your readers as well as payment for publishing my articles. Please let me know if you would like to discuss details, topics or if you have any questions. Hi User, thanks for reaching out. Not yet, a self service affiliate program is a little ways away. If you do work directly with clients we can work out a reseller agreement for companies you bring on annual contracts with more than 10 seats. Let me know if you want to discuss that further. These are generally very limited in range, and be handled with saved replies. Address all Stripe concerns directly, but be sure and tag the Sales manager. We need to change your plan on the back end to apply the discount. Feature requests are when users suggest a new way to use our platform that isn't currently available. Since many of the feature requests are common, we have the following examples of situations where you can use a saved reply. If not, respond with the 'We'll add it to our feature board' saved reply. 'Hi there user, Thanks for reaching out! In the meantime, i'm curious about how you're using Process Street. Hopefully I can come up with a customer solution for you. Thanks for the idea, I can definitely see that working very well. I'm going to go ahead and put this on our feature board, where I will discuss it with my time at the end of the week. I’d like to learn a little bit about how you’re using Process Street. While we talk about this feature internally, maybe I can guide you to another solution that might solve your problem. Just reply here if you want to chat. I am always happy to help. Sometimes tickets combine multiple questions that span different categories. There are generally two types of mixed-type questions. 1. How do I add a new user to all my checklists? 2. Is your business plan still available at the discounted price? 3. Are you open 24 hours a day? This is why saved replies are built in blocks, so you can use multiple saved replies for one mixed type question. 1. To add a new user to your checklists, you can add them as an admin in your organization, so they will have view and edit rights on each checklist. You can also enter their email in the 'assign field' on each template, or checklist, you wish to apply this. After entering their name once, the field will auto-populate. 2. We are happy to honor the discount code you received. I'm going to notify our sales staff and they'll organize this with you ASAP. 3. We are indeed. Just drop me a line here and i'm happy to help. I just created a new folder and I added several templates inside. However when I try to move the folder to a different organization and export it's contents, I'm not able to. How do I do this? First, you cannot transfer templates between organizations at the moment, however we are currently on working something similar. If you aren't concerned with the content being public, I have a solution for you in the meantime. 3. Switch organizations to your desired organization via the organization switcher in the top right. This is a question where any support agent still cannot figure out an issue after establishing a dialog with a client. When talking about a feature request and you aren't sure on it's release date. Confer with the development staff on the general release date. Explain you can only create public templates, not checklists. Many times customers will ask questions that show that they're new to the app, or don't fully understand a feature yet. It is YOUR job as a client facing support warrior to not only guide the user through a particular feature, but to coach them on overall usages of the platform. I'd like to get to the bottom of this for you. I see you were experiencing x while trying to do y. Could you provide me with a screenshot of this happening on your end? Did you notice button X when you were on this screen? The overall goal with managing technical tickets is to attempt to replicate any issue that can be identified, and to prioritize them accordingly. When you have a technical issue, you will need to respond and say we're looking in to it and begin the steps below. There is more detail about replicating issues starting with task #15 and the task #16. Respond to client informing them that we are testing it and will revert to them shortly. "Hi X, Thanks for reaching out, I'm currently testing this issue for you and will keep you informed as my investigation continues. I'm sorry about the inconvenience in the meantime. I'll get back to you as soon as I discover a solution for you." Assign the ticket to yourself for the investigation process. Be direct, and to the point. Make sure the client knows that his or her concerns are getting taken care of. Try to replicate in your own organization (if applicable and not an account specific issue), Do this on Chrome, Safari and Internet Explorer. Follow as much detail as the user gives you. If you can replicate the issue take a screenshot and see task #15. If you could not replicate the issue, see task #16. Create a github issue (For now, all of non-internal bug reporting is based on http://www.process.st/bug. In the future, if you can replicate it you will tag it with a Github issue number which will trigger a zap that will create the issue automatically) and link screenshots of your replication, preferably in evernote. Inform the client that you could replicate the issue,"Hi there, thanks for reaching out. I was able to replicate this issue on my end, so we will be opening a bug report. I'm going to talk to my technical staff and revert to you when the issue is fixed." Assign the ticket to the development box. NEVER, EVER leave development tickets assigned to you after you have completed the steps above. This is where you will ask the client to give more details. This SHOULD NOT include information you already know. Ask the user more questions about how they reached their error. "Hi there, I'd like to get to the bottom of this for you. Could you tell me exactly which screen were you on when this occured? Hi there, were you trying to edit a live checklist? Ask the user for a screenshot. "Hi there, would you mind attaching a screenshot of exactly what screen you see when you encounter this issue?" "Do you mind sharing a screenshot with me?" With all of this information collected, assign the ticket to the development box, unless the customer says the issue is no longer occurring.